Well, Dear Reader, I try to stay true to my word - except when I'm deliberately lying of course (not that I'd ever lie to you) - so here is that promised review of "Intelligence and Private Investigation - Developing Sophisticated Methods for Conducting Inquiries", edited by Hank Prunkun, PhD. Sadly, I came away slightly disappointed. Firstly, the annoyingly overused term "post-9/11". Yeah I get it, the world irrevocably changed on September 11, 2001 - except that it didn't really. The world wasn't inherently more dangerous on September 12 than it had been on September 10. What suddenly changed were our perceptions of reality. The threats had already been in place for quite some time and had been steadily evolving. We just didn't see them for what they were, or realise their significance. An intelligence failure, if you will. Anyway, I digress. While the authors make some points in regards to the realities of *cringe* post-9/11 investigations, I feel they overstate their case: expansion into anti-terrorist investigations? Okay, perhaps I'm being a bit unfair. I know of cases where corporates kept tabs on various politically-motivated groups at odds with their corporate agenda. However, those groups were far from terrorists and the actual threats posed laughable. Perhaps I'm just annoyed that three chapters are devoted to the quite specific and, in my opinion, barely relevant to the world of PIs, subjects of political intelligence, anti-terrorist and anti-gang intelligence, and illicit organisations and financial intelligence. And, in fact, that's where this book fails me the most. Rather than specifically address how intelligence-led investigations can be utilised in the traditional areas of private investigations - like the title suggests - it instead seems to focus on particularly niche areas that are largely outside the realm of our profession. Sure, companies like Kroll, Hakluyt, or Control Risks Group are examples of private intelligence organisations offering investigative services to large corporate entities. However, they operate on a scale, and budget, beyond most of our, more modest, dreams. "The badge's central crown symolizes the licensee is under the legislative control of the Queen... ...and the laurel wreath symbolizes the noble attributes of courage and valor." And here is an amusing rejoinder (although written some years ago) on the subject of PI badges. So, overall, the book was a disappointment. However, don't think that there is nothing of value to be gleaned from within - it still remains a relatively interesting read. However, rather than a 'how-to' approach, such as you would expect in a technical manual, rather each chapter is more akin to an academic primer, perhaps in relation to a course of study. 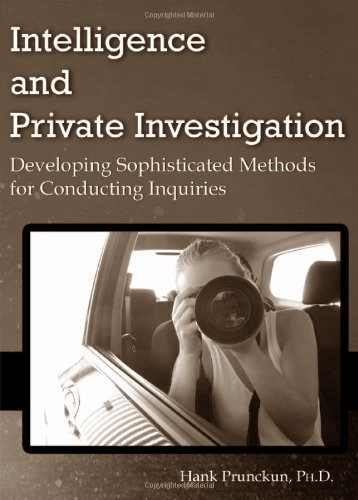 Again, seemingly at odds with the book's subtitle - Developing Sophisticated Methods for Conducting Inquiries. Misleading Title. Pretty much set me up for disappointment in that I was expecting a technical manual on tools for incorporating intelligence into private investigations. While there are some discussions on various methodologies, such coverage is only cursory at best. The price. Around US$35.00. Probably priced correctly for what you get. I'm afraid I can't really rate it higher than a C as it really failed to satisfy on a number of levels - most of which is due to the title implying one thing, but the book providing something else entirely. I'm not saying it's crap. It just wasn't what I was looking for.